If budget or time is your primary concern, then eloping is for you! My lovely wedding chapel, Blessings, is the perfect place to tie the knot. 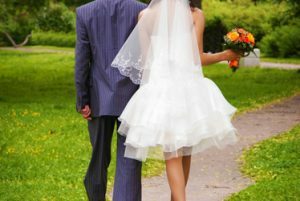 Eloping doesn’t have to be like it is in the movies! Even with our smallest package, you can have four loved ones with you on your day, and “running away” to get married is completely optional. A New York elopement can be a truly special occasion and I would love to share this with you. Check out elopement packages below, and feel free to call us anytime if you are wondering how to elope, where to elope, or if eloping is the right choice for you. Elopement packages are available at Blessings Chapel or Ron can come to you with a reasonable mileage charge. I will review your license, offer you a choice of a religious or non-religious wedding ceremony (all faiths and multiple faiths welcome) with choice of one reading. I will perform the ceremony and file your license. Up to four guests. I do, I do, plus a choice of one or two of the following options: titanium rings, a bouquet, bottle of sparkling wine (proof of age required), first dance, three pictures on your device, walking tour of historic Schenectady with a memory card. Up to 12 guests. I do, I do, and all of the following: a night at the Belvedere Hotel, titanium rings, a bouquet, bottle of sparkling wine (proof of age required), first dance, three pictures on your device, walking tour of historic Schenectady with a memory card. Focusing on what is most important: Your love for each other. You’ll minimize stress. Time. Get your marriage license today, be married tomorrow. Boom! One stop shopping. Beautiful flowers, nice rings. Still less than your car lease payment. Family angst. Overly dramatic family? Not at your elopement. They’ll get over it, and you will be married. The band being late. We’ve got Bluetooth. Not having to return silly wedding gifts. You’ll still get a couple, but far less wasted time. Not stressing about bankrupting your friends into wearing one time dresses. Keeping drunk driving down. You all have friends and relatives, who cannot control themselves at an open bar. It really put the damper on my wedding to arrange car rides for guests.